This sweet concoction will have your tastebuds reminding you of fair food pasts! 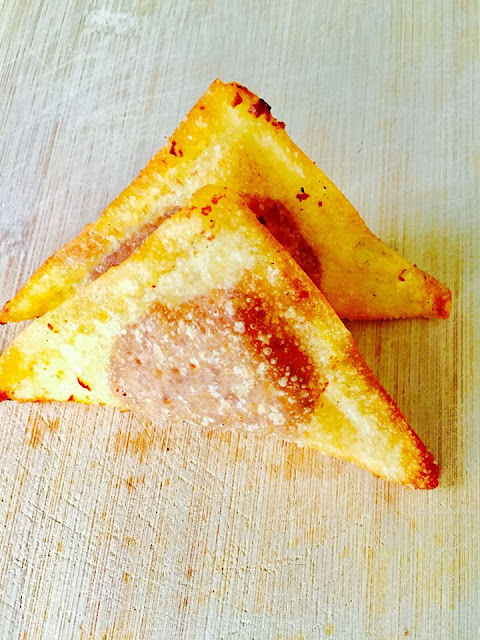 Fried and nutella-ey, you can't go wrong with this cream cheese rangoon variation. A couple of weeks back, I made these buffalo blue cheese chicken rangoons. They were nothing short of amazing and are one of my favorite makes of this blog thus far! Anyways, we had a few wonton wrappers left, and we decided to make a sweet rangoon to compliment our savory one. We ended up with the nutella and cream cheese goodness you see above. I don't know if I can pick a favorite between the savory or sweet, but thy were both amazing. If you are a nutella fan, a fair-fried-food man, and a fan of all things delicious, then you will love these and have a hard time putting them down! Add some sweet to your savory with these! Enjoy! !